Hone your skills with American Poker II™ ! One of the best games to play Poker on when you need to practice your strategies, American Poker II is now free to play on the Gaminator Online Casino! Gaminators American Poker II is the classic poker game everyone knows, remembers and loves. Try to get the best hand to win big. From two pairs to a Royal Flush. If you have Jacks or better, you’ll receive a mini bonus! Poker is being played in everywhere across the globe. Be it in clubs and bars on the US coasts, exclusive casinos in Europe, Asia or the Middle East, highly prestigious Poker tournaments and of course online casinos and card game platforms, the amount of people playing Poker has exploded in the past decade. Never has there been a bigger community of people playing the same card game, at all levels of play. From young beginners to seasoned veterans having won several championships, titles or bracelets, no age group is being excluded. Famous Poker players stem from all countries corners of the world, and Poker is one of the few games truly traversing cultural borders. The big difference between American Poker II and regular Texas Hold’em is the Joker Card acting as a wild, potentially substituting for missing cards to complete a winning hand with. Not to mess with your game, but rather to give you a chance against the AI. Because it’s ruthless, and you will need all the help you can get to score wins for yourself! Winning combinations however are taken straight from the real card game. 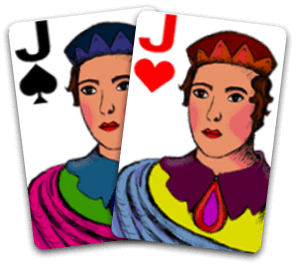 From pairs (2 cards of the same value), to 2 pairs (2 sets of the same cards), over to the Drilling (3 cards of the same value), lowest combinations are connected to lower payouts. Moving on to Straight (5 cards of consecutive values in any suite, such as 4 of Clubs, 5 of Diamonds, 6 of Hearts, 7 and 8 of Spades for example), Flush (5 cards of a suite of any value) and of course the Full House (3 of a kind and 2 of a kind), these winning combinations are already worth a quite a lot. Of course the rarest of combinations will net you the highest payouts in American Poker II: Straight Flush (5 cards of the same suit in increasing values), Royal Flush (10, Jack, Queen, King and Ace ofg the same suit) and even Five of a Kind (don’t forget about the Joker in this game!) will reward you with up to 6000 times your initial stake! Playing American Poker II will make you a pro in no time! Just as no regular casino could exist without Poker or Blackjack tables, neither can of course the Gaminator social online casino. It would seem only logical for us to include American Poker II into our portfolio of exciting and entertaining online games right here on our site. The game does not just offer you huge payouts for your wins, it will help you prepare for your future matches against real people! 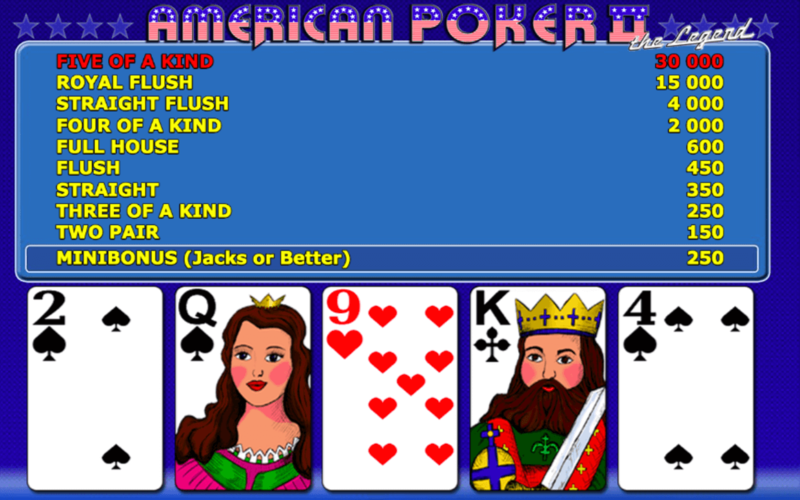 Play American Poker II on Gaminator right now!